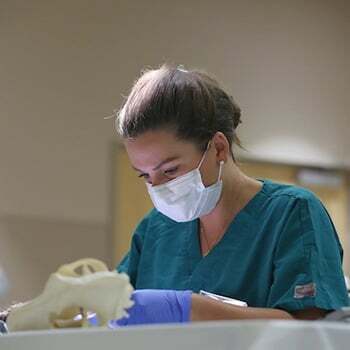 The field of surgical oncology has advanced and become sought out in veterinary medicine. More extensive surgeries are possible and more acceptable. This course is designed for board certified surgeons, residency trained, surgery residents and veterinarians with advanced surgical training, experience and skills. This course offers surgeries including but not limited to mandibulectomy, maxillectomy, orbitectomy, nasal planum resection, chest wall resection, liver and lung lobectomy, vascular access port placement and hemipelvectomy. This course was created and will be taught by boarded surgeons with experience in surgical oncology, oncology fellowship certification and a passion for teaching. “The instructors worked really well together and were very patient during the labs. Great attitude towards teaching"